INTPs are known for their inventiveness and creativity. These analytical types prefer to stay out of conflict as much as possible, but when they do have to face it they tend to use their creativity and ingenuity to find unique, one-of-a-kind solutions. 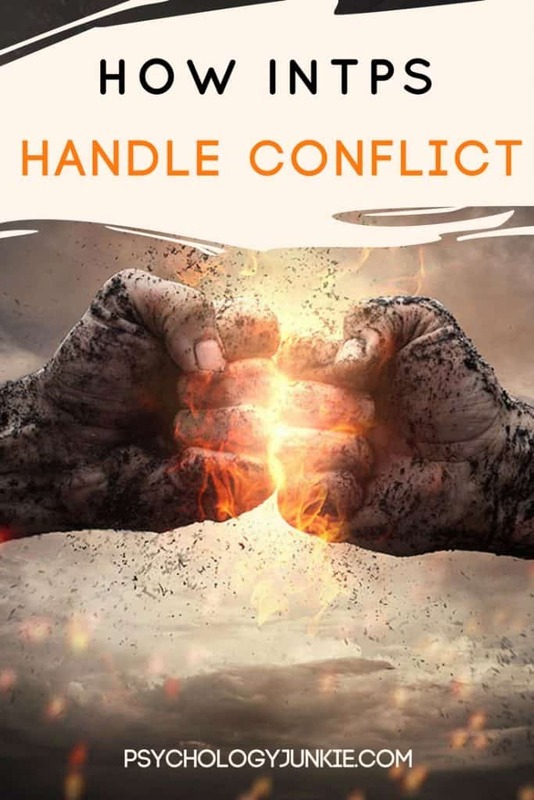 They can enjoy a lively debate or a friendly argument, but emotional conflict or tension in relationships can drive them to withdraw from people and the tumultuous emotions in the atmosphere. INTPs experience the most conflict when they are in highly-charged emotional environments, when they are dealing with irrational people, and when they are stifled or forced into rigid structures. INTPs want freedom and space to explore, to analyze, to discover. Being around intense, overwhelming emotions triggers their inferior extraverted feeling (Fe) function and can cause them an enormous amount of stress. As highly rational individuals, having to communicate entirely on an emotional wavelength is exhausting for them. Having tight boundaries placed around them can also make them feel trapped and controlled. Unlike many other types (particularly SJ types), INTPs tend to dislike routine, structure, and a predictable schedule. According to the MBTI® Manual, INTPs have a “compromising” conflict style. They view conflict as a necessary part of life and will try to remain as logical as possible when finding a solution. They want time to analyze the situation from all angles before facing it head on. INTPs don’t seek out conflict, and tend to try to ignore it unless they deem it especially important to address. When they do address the conflict, they will consider pros and cons, cause and effects, and creative solutions. They will want to hear other people’s perspectives, but will quickly lose interest if they have to listen to emotional reactions for very long. Mary, an INTP I spoke with online, said that to resolve marital conflicts, she and her husband schedule weekly outings where they discuss their various positives, negatives, and bounce ideas off each other. She states, “It has to be enjoyable, too…I make a point of making it enjoyable otherwise it could become a fixture of dread.” This is a perfect example of INTP creativity. I loved hearing how Mary could turn something like conflict and disagreement into an enjoyable weekly experience that was full of open, non-judgmental conversation. – An innovative, creative resolution. Embrace your creativity as you think of unique solutions to the problem at hand. Don’t be afraid of expressing your out-of-the-box strategies and ideas. When dealing with Sensing types, try to focus on clear facts, and speak through your case in a sequential order. Refrain from “jumping around” from one idea to another or one section to another. This will frustrate them. When dealing with feeling types, try to validate their emotions even if they may seem frustrating to you. State your logical perspective, but try to do so without discounting what they feel or their desire for a harmonious resolution. Don’t put off dealing with conflict for so long that eventually you become overwhelmed and “blow up”. Do you have any tips or experiences in this area? Feel free to let us know in the comments! A tip from an INTP who is married to an ENFP: classify emotions as facts/data about the situation at hand. “Such-and-such makes me feel sad” is a fact to work with, not an irrationality to dismiss. You don’t have to fully understand these facts to find ways to deal with them, just like I don’t have to understand everything about meteorology to appreciate that rain means I should carry an umbrella. Emotional states may or may not be shiftable, but insisting that someone else should simply change them or get over them is not actually rational, not a reasonable demand, and it’s CERTAINLY not constructive. As an INFP whose SO is an INTP, I wish there was a “like” button I could click for this. Being an INTP I’ve had to deal with many different people and I had to understand everyone comes from a different background, I guess that’s something we all should keep in mind to validate the other persons’ arguments. I pretty much elude conflict until is time to face it. But I like to face it after I have linked all my arguments in a coherent, cohesive and diplomatic way (although when I speak they don’t come out exactly in order but the idea is there). And practice a lot of PATIENCE.